The common predictionist name commonly refers to the meteorologist responsible for developing weather forecasts. This article describes the functions of a forecaster in 2016, as well as the tools and methods he uses. All global weather services, public or private, include forecasting positions in their organizations. Part of the article is devoted to their main responsibility: the safety of people and property. But forecasters are also involved in many sectors of activity, sensitive to weather or climate, by providing decision support based on observed and forecasted conditions. The forecaster’s first function is to explain and describe, for a user or client, the future weather conditions in an area of interest. It must deliver a quality technical message with appropriate communication. This mission is an old one. It is currently present in all public National Meteorological Services (NMSs) but also in private sector entities dealing with meteorology. It is also the subject of international comparative studies in terms of staff and costs for these structures. The way in which this function is carried out has been marked by a strong evolution in recent years in line with the remarkable progress of Numerical Weather Forecasting (NWP) on the one hand (read Introduction to Weather Forecasting), and the means of observing the atmosphere on the other hand. Without providing a historical background, the systematic use of NWP models for forecasting can be traced back to the 1970s and 1980s. It is from this period that numerical forecasting begins to provide relevant information on the possible anticipation of the occurrence of storms at mid-latitudes. Predicting these phenomena, which can cause considerable damage to people and property, is still a major concern in Europe today. Significant storms led to the creation in France of an international meteorological service  within the Paris Observatory in 1856 and the implementation of the meteorological vigilance system  in 2001. The forecaster’s work is now essentially based on the interpretation of the available numerical simulations. It monitored progress in the means of constructing forecast data, such as improving the quality of the NWP models themselves and their post-processing (statistical adaptations). It has been made possible by the evolution of the possibilities to use the information provided and to visualize the planned fields. These have in fact shifted from graphic outputs on paper to computer representations . In addition, the possibilities of formatting and disseminating these forecasts have increased (print media, audio-visual, telephone kiosks, Internet, mobile phones). Today, the company’s performance requirements and the volume of information to be taken into account in very short periods of time make the work of the forecaster both difficult and exciting (Figure 1). The forecasting techniques depend on the spatial and temporal scales of the “meteorological object” being forecast: a windstorm on a Pyrenean summit for the afternoon, an episode of heavy rainfall over the Cévennes for the following day, a heat wave in France for the following week. All of them are based on the approach, which includes two stages known as analysis and forecasting. The analysis step consists in studying the current and recent past meteorological situation, understanding its dynamics, identifying relevant structures and contextualizing it in relation to climatology. In particular, it is necessary to identify to what extent the simulations of NWP models mainly, but also other products using extrapolation techniques, available for the moment under study, are consistent with the meteorological reality as it can be apprehended by the different observation methods (Figure 2). This analysis generally starts at the so-called synoptic scale  which is the relevant scale for a forecast from a few hours to a few days for a country like France, or more precisely an economic region or a department. For several years, the method has been based in particular on a combined in-depth study of surface and altitude conditions in the troposphere. Monitoring the dynamic tropopause (read The atmosphere and the Earth’s gaseous envelope), highlighted by the concept of a potential vorticity, is indeed crucial to understanding the evolution of weather conditions at mid-latitudes . In tropical regions where the phenomenon of convection dominates, other concepts  are needed (read The Key roles of the trade winds). This synoptic study, formalized in Météo France by the graphic documents ANASYG/PRESYG , is present in the various NMSs and carried out by forecasters at a national level. The objective is then to qualify the best forecasting products of the moment which can then be exploited. At the regional or local level, once this synoptic framework has been integrated, it is possible to carry out a similar analysis on a smaller scale. The forecasting step consists, first, in understanding how the structures identified during the analysis will evolve with the numerical simulations or, failing that, the available extrapolation products, which best represent them. In the short term, as this evolution is more or less linear, it is quite easy for the forecaster to correct defects diagnosed in the previous step: the geographical shift of an area of precipitation or fog, the underestimation of the intensity of the deepening of a depression for example. This forecast is called deterministic. In the longer term, since the evolution of the atmosphere is non-linear, some structures may disappear and others may be born. It is the strength of numerical modeling (read Weather forecasting models) to have the ability to simulate these events that an extrapolation, by definition, does not allow. The difficulty then lies in the fact that the analysis does not give the possibility to discriminate between the different options that may be present in numerical simulations. In a second step, the approach thus becomes probabilistic. Among a range of possible developments, the forecaster looks for the most likely scenario, assesses the issues involved in forecasting and seeks to make the one that minimizes the potential forecast error. This evaluation is based on the use of ensemble forecasts (Atger, 2000)  (read The ensemble forecasting) but is also carried out by comparing simulations of the different deterministic models made available by the NMS. It is important to note here that the concepts of short and long term are related to the meteorological phenomena that we are trying to predict. We are talking about a predictability horizon: for a storm, it is a few hours, for a windstorm of a few days. It should also be added that the knowledge of model behaviours, acquired through the forecaster’s experience in his regular activity of analysis/forecasting and verification of his own forecasts, makes it possible to identify certain recurring defects in these NWP models. These elements are involved in the forecasting process, but are also used to improve the numerical forecast itself (reduction of identified biases). Paradoxically, this feedback makes it increasingly difficult for forecasters to critically examine models! Finally, the joint use of global models (covering the entire globe) and limited-area models (covering a limited geographical area) will be emphasized to address the problem of the different scales of atmospheric phenomena. An additional difficulty is that a limited-area simulation does not necessarily zoom in on the forecast used for its coupling, but that with some autonomy, this small-scale forecast can differ significantly from the larger-scale one. Warning authorities, citizens, transport, energy and communication infrastructure management stakeholders of the possibility of a meteorological danger is one of the main operational missions of NMSs, one of the reasons for their very existence. Since 2001 in France, this function has been carried out at Météo France through the meteorological monitoring system (Beysson, 2001) . The implementation of this procedure, adopted in more or less similar terms by many countries, particularly in Europe, is the responsibility of national and regional forecasters in metropolitan France. Since it requires continuity, the organization of work is organized into permanent services that provide a 24-hour weather watch. This monitoring or follow-up role, sometimes underestimated, is essential. It consists in detecting any potentially dangerous meteorological phenomenon that has not been anticipated in order to warn users who may be exposed to it as soon as possible. This task is difficult because, on the one hand, the phenomenon is by definition unexpected, and on the other hand, because the means of observation may be insufficient to detect it. For example, it is impossible to perceive the snow and ice conditions on certain road sectors in winter. In this field, the emerging technologies of connected vehicles offer interesting possibilities of use for meteorological observation. The role of anticipating dangerous phenomena is carried out by the vigilance watch map. This indicates by department the level of vigilance required in the face of meteorological and hydrological dangers for the next 24 hours, using 4 colours: green, yellow, orange, red. The choice of colour is based on criteria for exceeding the thresholds of the parameters taken into account (9 hazards in 2016). These criteria reflect the vulnerability of the site in relation to these hazards. They were built knowing the climatology of the phenomenon and in consultation with the public authorities in charge of the actions to be taken in the event of a warning (civil security, health authorities). The analysis/prediction approach allows forecasters to choose the right colour while taking into consideration the context of the situation (dry soil conditions, road migration during holidays, etc.). Forecasts are systematically evaluated and feedback is provided. The procedure sets ambitious targets in terms of detection, false alarms and anticipation times. The high media coverage of certain events causes periods of tension. These place forecasters at the heart of decision-making mechanisms in a crisis management context (see Figure 3). It should be added that monitoring and anticipation roles also exist in specialized sectors. Special warning procedures apply in the maritime field for sea states. Others are being implemented in the aeronautics sector for volcanic ash suspended in the atmosphere, icing and turbulence phenomena that threaten aircraft safety. These latter procedures are carried out by forecasters with qualifications recognized by the international civil aviation organization. Finally, forecasters intervene in so-called environmental emergencies in the event of nuclear or chemical accidents or marine pollution. The use, on demand, of specific numerical models, known as dispersion models, makes it possible to provide information on the geographical areas that may be affected by pollutants. Some sectors of activity whose achievements depend on weather conditions use the services of meteorological entities to meet their needs. This function is called meteorological assistance or advice (Figure 4). Some structures choose to integrate this function within them. This is the case, for example, in France in a company such as EDF, where teams of forecasters are involved in the management of water resources for hydroelectric production. Other structures, which have more specific needs, outsource this function. Sports event organisers are highly publicised requesters. The missions are then carried out by specially trained forecasters. They provide tailor-made services sometimes by travelling to the place of activity to be as close as possible to the user. They can use dedicated observation means, such as mobile weather radars, which make it possible to significantly improve the anticipation of the occurrence of precipitation at the event site. In France, attendance at the Roland Garros tennis tournament is an emblematic historical example. This type of service has since become widespread. We are talking about weather routing for sailing races at sea, or expeditions in the mountains . The weather factor can be crucial to a company’s success. One example is the PlanetSolar project, the first round-the-world boat trip powered solely by solar energy in 2010-2012. 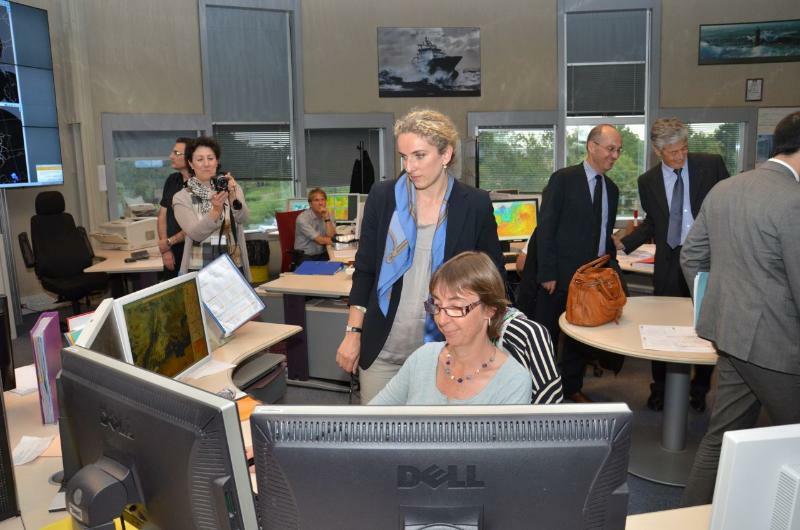 This adventure mobilized forecasters from Météo France’s Marine division. They first carried out an upstream climatological assessment to determine the best maritime route to follow a priori, thanks to the study of observations and available numerical data on winds, sunshine, surface marine currents and waves. Then, in real time, they assisted the ship during its 18-month voyage around the globe. They provided daily forecasts and continuous monitoring of the situation to ensure that the vessel avoided windstorms and clouds. The spectacular improvement in numerical weather prediction (NWP), the sharp increase in the spatial resolution of models (at kilometric level), the time step of data availability (intra-clockwise), the frequency of forecast refreshes (increasingly close assimilation cycles), are changing and disrupting the role of the human expert in the forecasting process. The volume of information available is now such that it is sometimes impossible to assess this process in a given time frame. An increasing proportion of forecasts are therefore automated, i.e. made available to the user directly by a computerized processing chain without human intervention. In addition, the cost reduction policies implemented in many entities in both the public and private sectors tend to limit the place of the human expert within these structures, which are therefore seeking ever greater automation. When and in what areas should the forecaster exercise his or her expertise? Should we focus only on situations with high societal or economic stakes? Should expertise invest in the new fields of application of forecasting that are currently emerging at monthly and seasonal scales? These are the questions facing weather services in the 21st century. Computer representations take many forms: maps, spatial and temporal sections, animations. They lead to performances such as augmented reality and they make it possible to know the current meteorological conditions (the present time) by studying spot observations, radiosondes, radar or satellite imagery, and shared information on social networks. To cite this article:	GILLET-CHAULET Bruno	(2019), The role of the forecaster, Encyclopedia of the Environment, [online ISSN 2555-0950] url : https://www.encyclopedie-environnement.org/en/air-en/role-of-forecaster/. 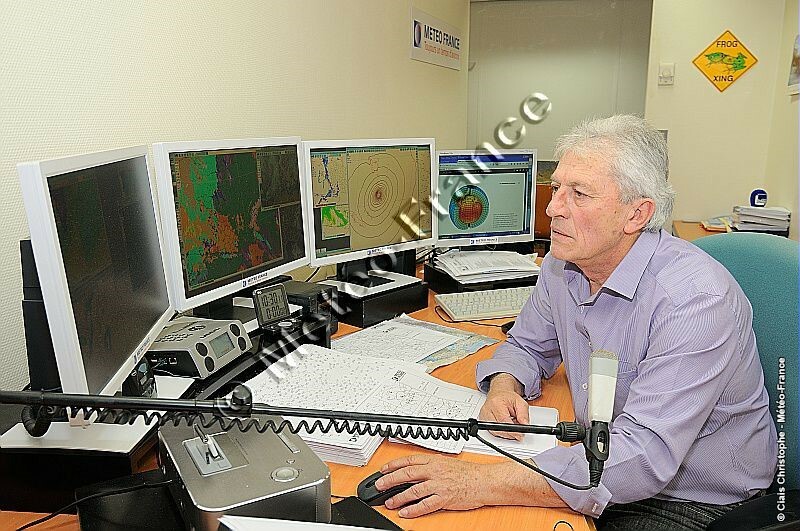 GILLET-CHAULET Bruno, Chief Forecaster at Météo France (Direction des Opérations pour la Prévision, Prévision Générale, in 2016). Sylvie MALARDEL, Senior researcher at the Centre Européen de Prévision Météorologique à Moyen Terme (CEPMMT), Meteorological Works Engineer.